The Restaurant is one of the most popular restaurant themes and now there is a classic edition of it. It is even more powerful and it features even more great options that the original theme. Featured on ThemeForest and created by Red Factory, this theme has everything an excellent WordPress restaurant theme should have. It is highly customizable and very easy to manage, and it will make your visitors impressed by your website. 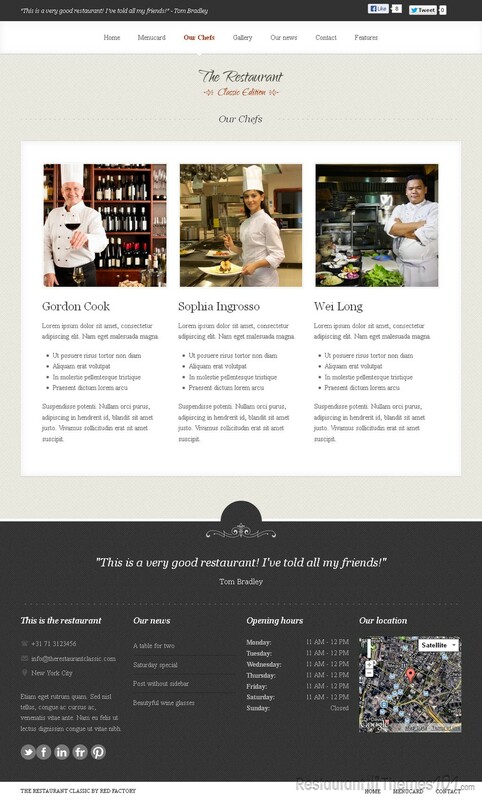 The Classic edition of Restaurant is created for anyone who is looking to start their own website for any kind of a restaurant. The advanced features this premium theme offers are excellent. The menu card you will have on your website is very easy to create and make no mistake – it will look wonderful because this theme offers a great looking sliding menu card and you can make as many different menu cards as you want to. You will be able to easily combine several different kinds of pages into one. You can add image galleries, posts, product pages or you can blog on literally any page you want to. If you want to make special front pages – no problem! It will be very easy and it will look sensational. Changing the colors of this theme is also very easy, and you can change any of the given colors with the possibility of seeing the actual changes in real time with the use of the new Live Style Changer offered. That’s not all; this theme is actually completely flexible and responsive. It will automatically adapt to any given screen size or resolution and your website will look great no matter what kind of a device it is viewed from – a tablet, a smartphone or a desktop, your website will look the same and your visitors are going to love how functional and attractive it is.